What is Salsa in the Park? Picture this: It's summer in Boston. At least once a week, under the locust trees of a courtyard patio surrounded by basketball games and children playing, lies 2-3 dance floors that heat up while the cool of the evening and night breezes through. Dance floors are filled with footwork, styling, twists and turns from dance and music lovers from all over Greater Boston! You've entered Salsa In The Park. 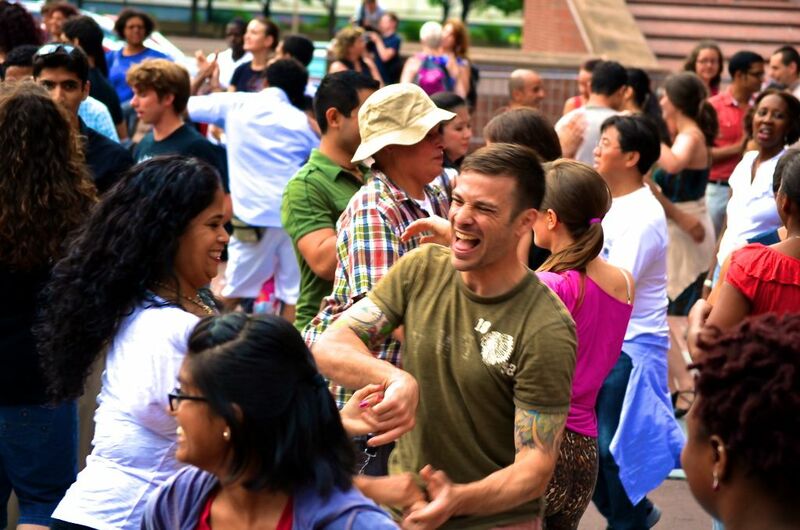 A free and popular outdoor summer series for all ages, backgrounds and abilities, Salsa In The Park is an innovative community engagement project that transforms public space for public benefit through music, dance and education. A public health initiative, featuring movement as a key to wellness, it draws over 500 people from all walks of life every Monday evening from 6pm to 9pm for salsa instruction (dance and percussion), high quality performances showcasing a variety of cultures and genres, social dancing and health and wellness promotion. 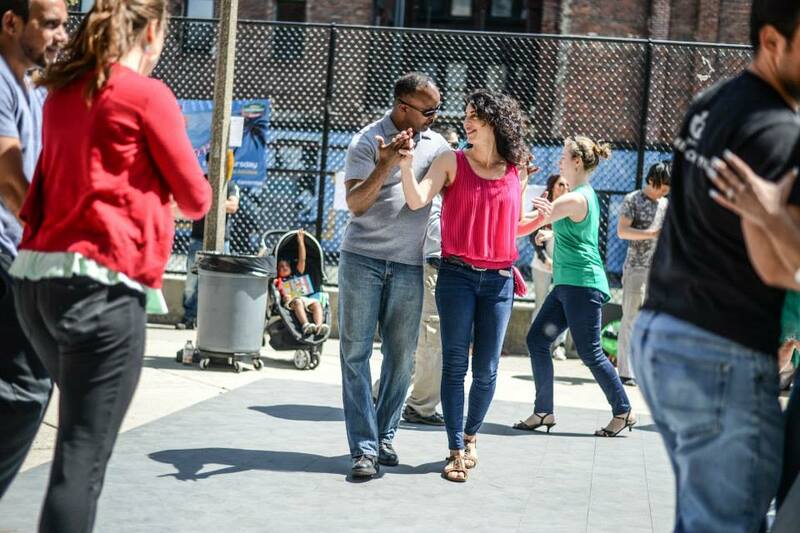 Our weekly Salsa In The Park is held at South End's Blackstone Community Center courtyard every summer. 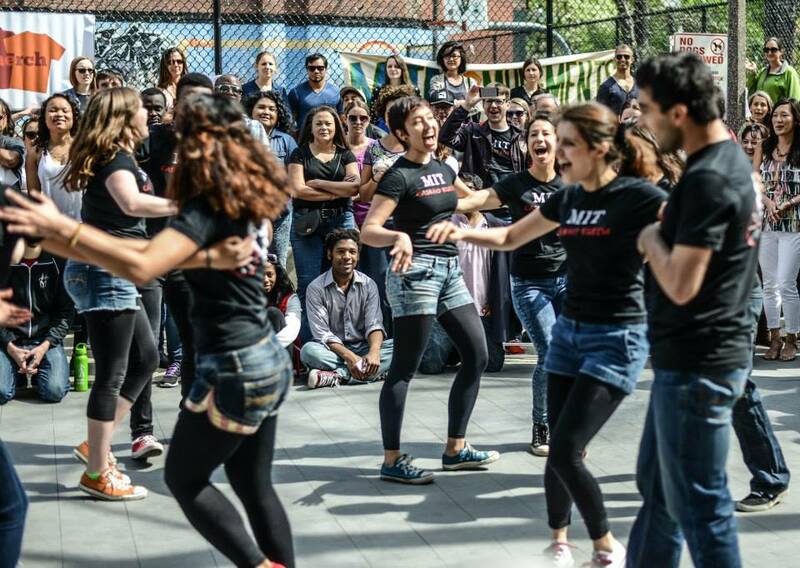 Many salsa & Latin dancers in Boston claim Salsa In The Park as their favorite event of the city, not only for the appeal of dancing outside "al aire libre," and witnessing engaging performances, but as a way to give back to the community. Dancers, and non dancers, volunteer all summer by donating their time to teach dance lessons to people of all ages and varying abilities; performing at the event; setting up and breaking down the dance floors; assisting with event staffing; maintaining a recycling program; and cleaning up from the festivities late into the night. 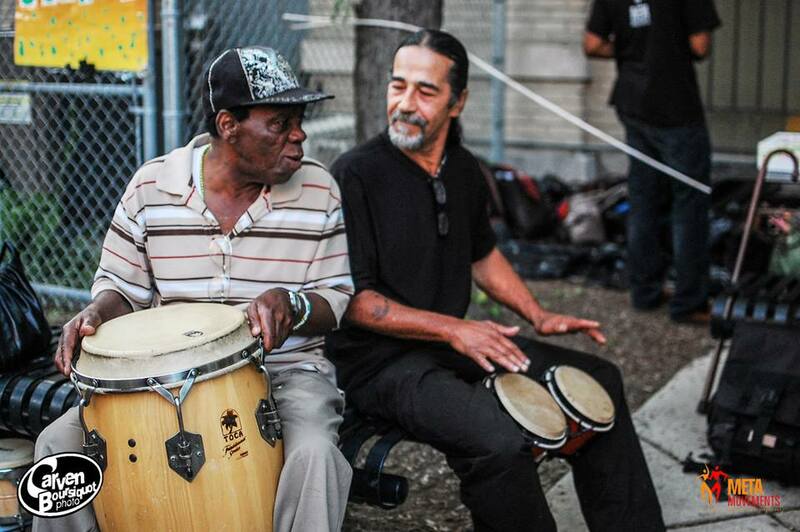 Want to bring Salsa In The Park to your neighborhood or event? Through grant funding, partnerships and contracts, MetaMovements is able to coordinate Salsa In The Parks and "Salsa in the Park inspired" events in various locations (indoor/outdoor, one time and series options available). Using our partnership with the Blackstone Community Center as a model for success, we have embarked on new initiatives and partnerships throughout the city in recent years. As Salsa In The Park continues to move throughout the city, we engage local partners and stakeholders to always produce a culturally relevant event. 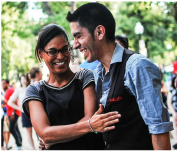 Besides our weekly Salsa In The Park at the Blackstone, locations have included Charlestown, Boston City Hall, Cambridge, Allston, Martha's Vineyard and South Boston's Lawn On D.
MetaMovements (MM) is an entrepreneurial artist collective dedicated to using the arts as a tool for positive transformation of self and community, creating bonds, fostering meaningful relationships and creating lasting social change. 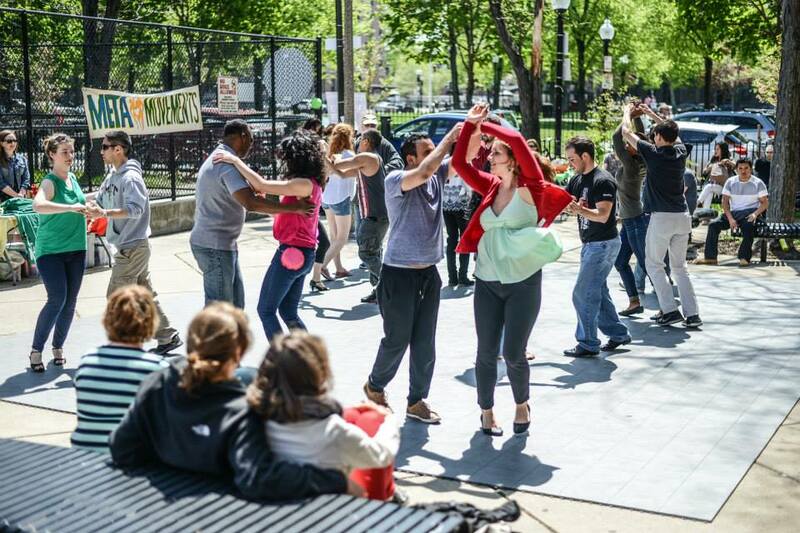 With community partners, supporters, funders and volunteers, MetaMovements brings Salsa In The Park to life! Our weekly Salsa In The Park is going on its 10th year and is made possible through our ongoing partnership with BCYF's Blackstone Community Center and others. For staffing of the event MM helps coordinate two internship programs and volunteers! Each summer, 25+ youth aged 12-19 will have a summer of transformation: becoming leaders in the effort to improve their community, building essential 21st century employment skills, studying and performing dance, music and theater (and learning to share their arts with others) all through MM's Youth Arts Ambassadors Program. The youth in the program spend numerous hours with healthy, driven and passionate adult role models that are hired through MM's Career Training & ﻿Practicum ﻿programs. If you are interested in volunteering, email us at info@metamovements.com as soon as possible. None of this would be possible without financial contributions from our sponsors, funders and Salsa In The Park attendees and supporters! We are currently seeking sponsors, vendors, volunteers and donors to get us the funding we need to make our weekly Salsa In The Park happen! Check out our homepage for information about our upcoming fundraiser events startin May 6, 2017! We hope you will join us! 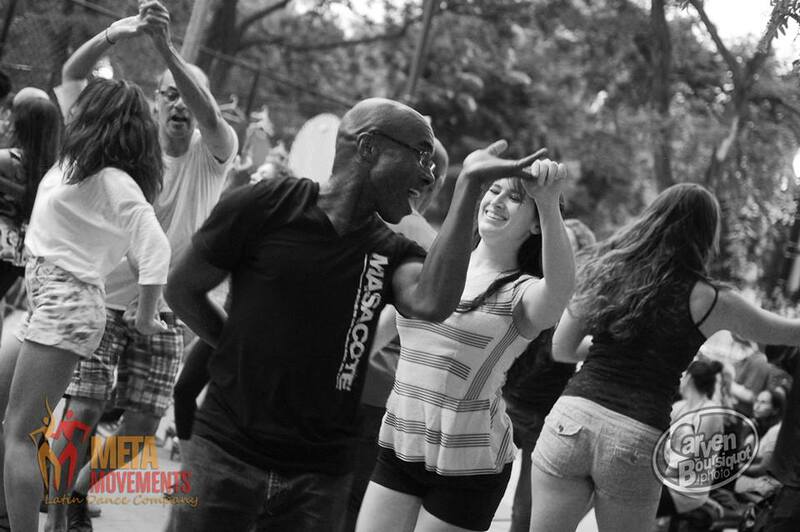 HISTORY OF SALSA IN THE PARK! 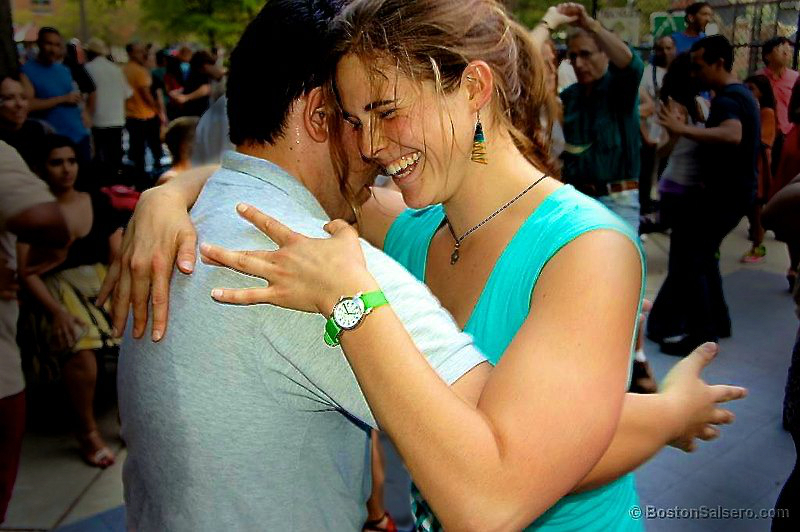 In 2007 at the Charlestown Community Center, MetaMovements, with the support of the salsa community in Boston, produced the very first Salsa In The Park (SITP) program. In 2008 we expanded SITP to the Blackstone Community Center to increase positive activities inside and outside of the Center in an effort to reduce violence and drug use that was happening in and around the courtyard. In 2014 we expanded SITP to include a Cuban area in which Boston Rueda has been an integral part of through teaching and engagement. To date our collaborative efforts have provided arts programming (dance, percussion, theater, events hosting) for thousands of families, including meaningful summer jobs and internships for over 150 youth, year-round internships for college students, and free weekly outdoor events which so many people look forward to every summer. We are proud of the work we have done together! Since the event's inception in 2007, MM has collaborated with Boston Dance Alliance, Charlestown Community Center (BCYF), Blackstone Community Center (BCYF), ArtWeek, Boston's Moves for Health, Cambridge Community Centers, Margaret Fuller House, Cambridge Public Health Association, Boston Centers For Youth & Families (BCYF), Cambridge Senior Center, Lawn On D and Spontaneous Celebrations with financial support from the City of Boston & the City of Cambridge, private foundations, DJ Hernan and SalsaBoston.com. Take a follow up beginner's lesson at 7:15pm! 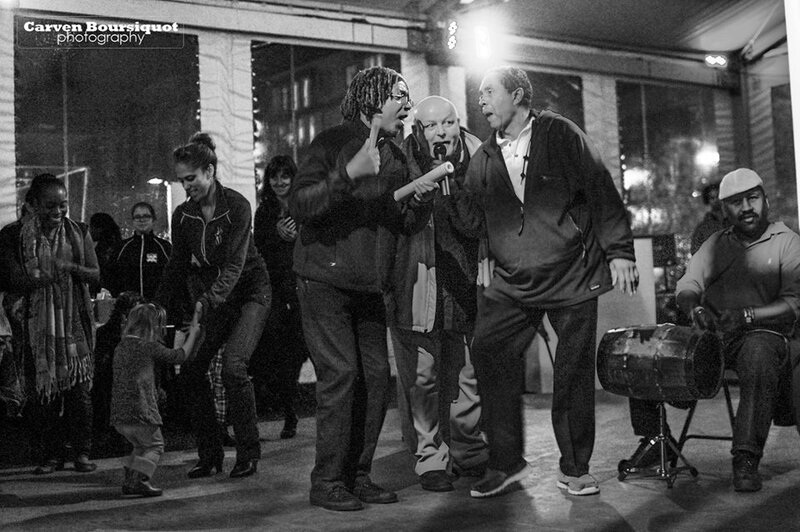 We take over the courtyard park and playground at the Blackstone Community Center and fill it with about 500 dance and music lovers each week! With the help of our awesome volunteers and Youth Arts Ambassadors, we setup up dance floors on the courtyard patio in-between the community center and the basketball court. There are 2-3 dance floors available providing plenty of space for all to dance under the stars. Dance floors are provided by SalsaBoston.com and the Boston Dance Alliance. In case of rain, we move inside into the auditorium of the Blackstone Community Center thanks to BYCF staff! If you have items with you, don't worry! We have a Bag Check area where you can safely leave your belongings with one of our MM staff(donations appreciated and encouraged). And if it rains, we'll dance inside at the Blackstone Community Center! Come join our Musicians' Corner, and JAM to the music! Bring your own instruments or play with dozens of instruments for everyone to have fun! Congas, Maracas, Claves, Bongos, and many many more. Fun kids activities including Arts & Crafts for the little ones if they get tired of dancing or shy away from dancing. Visit our free fruit infused water bar and purchase some healthy snacks! We emphasize healthy lifestyle choices for the individual and the community through dance, healthy food options, a positive & welcoming environment and encourage being and living "green". Our health & fitness interns (Masters of Public Health candidates from BU School of Public Health and Tufts University) are in this area providing educational pamphlets and facilitating health and wellness activities for attendees. 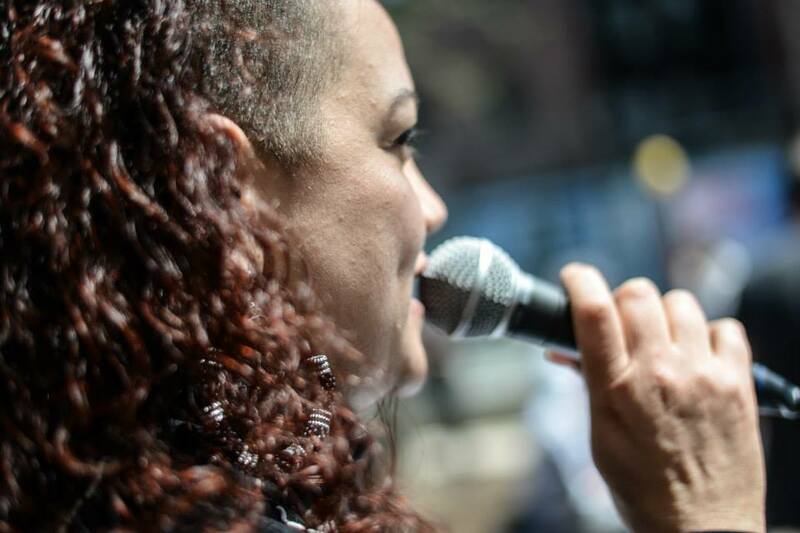 The Silent Rhythms program was inspired by one of our long term students Kerry Thompson, who as a fully deaf and partially blind person sought out inclusion and community through our performance team. Through years of hard work she found a transformation within herself to develop into a highly skilled Salsa performer. She then wanted to share this transformative opportunity with others by partnering with our company to create this unique program, naming it Silent Rhythms after her internalized understanding of the rhythm. Today staff are trained in how to make instant adaptations for people with other types of disabilities, be they physical or cognitive, so that ALL feel welcome! Email us to sign up for Silent Rhythms class! (in South End between Shawmut Ave and Washington St.
Orange line to Back Bay, exit Dartmouth Street side (it's about a 10 minute walk). Take a left on Dartmouth St and continue walking a few blocks until you cross over Tremont St. where Dartmouth St becomes W. Dedham St. Continue on W Dedham and then take right on Shawmut Ave. and the first left onto W. Brookline St. The center, courtyard park and basketball courts are on your left. Silver Line (SL4 or SL5 - Washington St line): Get off at the E Newton St. stop. You will be on Washington St. If you were coming from Dudley and towards Downtown you will continue in the direction the bus is going for one more block, and take a left at W. Brookline; walk down and the basketball courts, courtyard park and center are on your right. If you were coming from Downtown towards Dudley, you will walk back one block, and take a left on W. Brookline as described above. Take Bus #1 down Mass Ave. (from Harvard or Central Square). Get off at Washington St, and take a left (heading towards downtown, away from Roxbury). Continue to W. Brookline St., and take a left; walk down and the basketball courts, courtyard park and center are on your right. 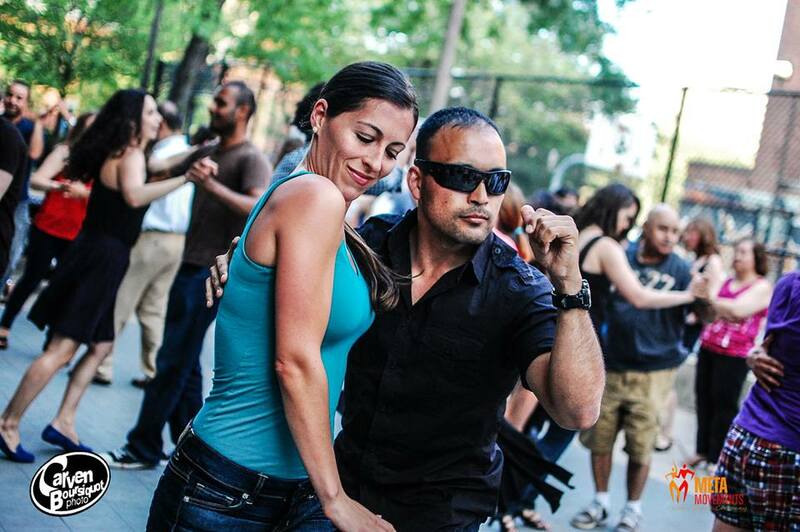 Salsa In The Parks & Salsa Outdoor Parties throughout Massachusetts!!! 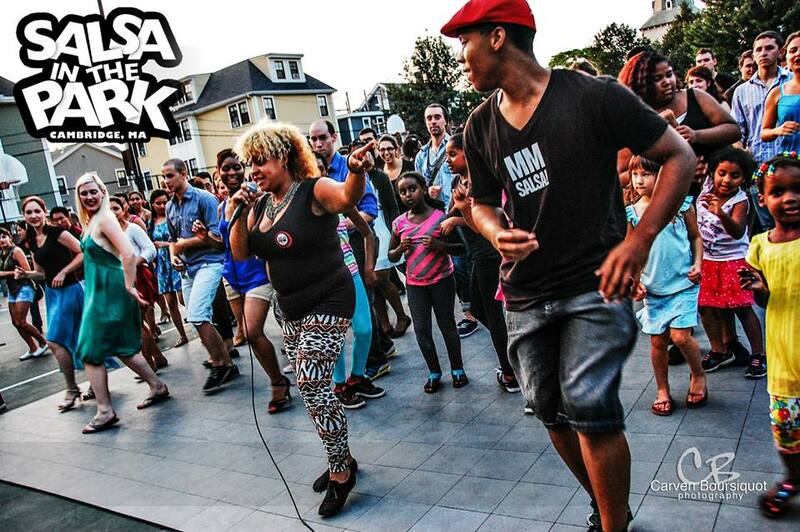 EVery summer we have various Salsa In The Park events throughout Massachusetts coordinated in part by our Youth Arts Ambassadors in partnership with various dancers, agencies, organizations and funders! Stay tuned for more information! Locations include Lowell, Cambridge and Somerville! JOIN OUR TEAM!!! Help us run our events in a variety of ways! Interested in joining our team of Volunteers? Sign up today here! ARE YOU A PERFORMER? 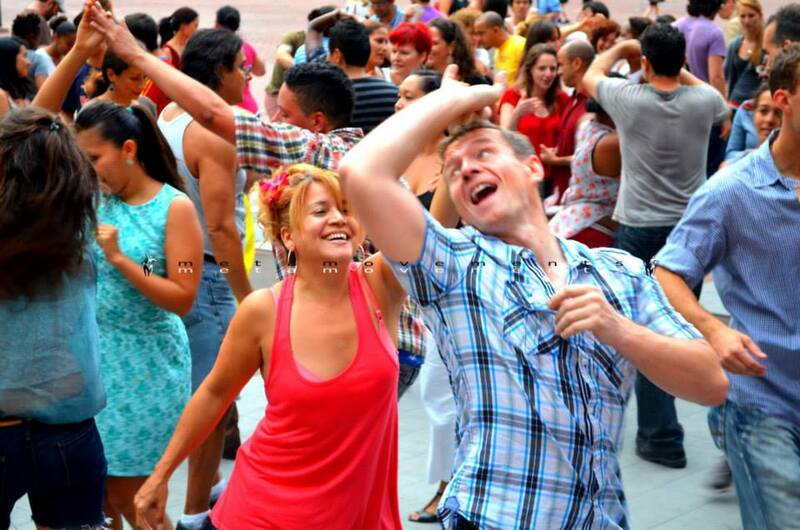 WOULD YOU LIKE TO SHARE YOUR TALENT AT METAMOVEMENTS' SALSA IN THE PARK EVENTS NEXT SUMMER? If so, CLICK HERE today for access to our brief artist/performance application! All performance genres are welcome to apply!